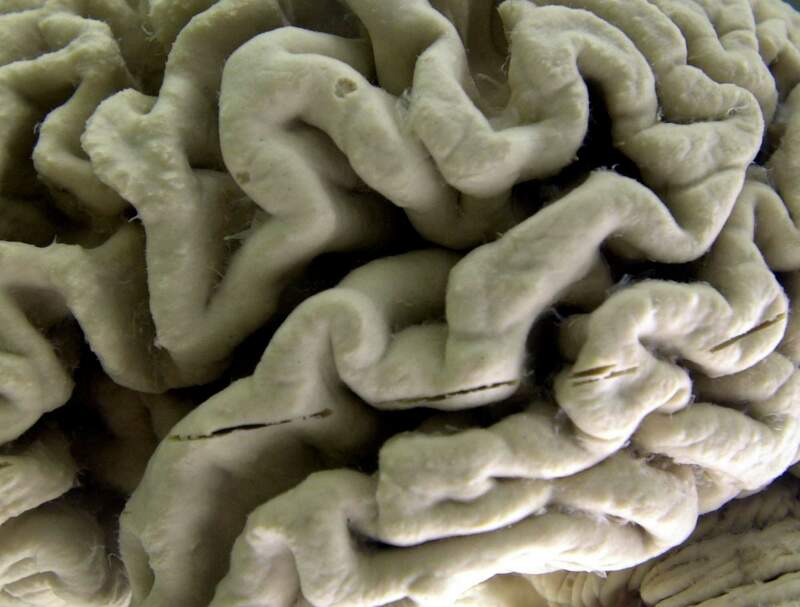 A closeup of a human brain affected by Alzheimer’s disease on display at the Museum of Neuroanatomy at the University at Buffalo in Buffalo, N.Y. Autopsies on nearly 1,300 older people found more signs of damage and one of the hallmarks of Alzheimer’s disease in the brains of those with higher blood pressure than among those with pressure closer to normal, researchers reported July 11, 2018. The study does not prove cause and effect, and it does not yet provide a comparison of rates of dementia or its most common form, Alzheimer’s – those results will take longer to parse. But it challenges a theory that high pressure is not as harmful in old age as it is when people are younger. The research began in 1994 and combined people from three studies of aging who agreed to donate their brains for autopsy upon their death, including the Religious Orders Study of Catholic clergy throughout the United States. All were over 65 and without known dementia at the start and were followed until they died – at an average age of 89 and after an average of eight years in the study. Two-thirds had high blood pressure, defined as a top reading of 140 or more when the study began (it’s now 130 under new guidelines adopted last fall.) Their pressures were measured once a year during the study – a strength of this work over some previous research that just relied on people to say whether they had high pressure or not. Researchers also found a link between higher pressure and one of the signs of Alzheimer’s – tangles of a protein called tau – but not another Alzheimer’s hallmark, amyloid plaques. This needs further research to understand the implications, Arvanitakis said.